There’s this tiny shop just off Main Street, on 21st Avenue, called Chocolaterie de la Nouvelle France, and they make fleur de sel caramels that I could spend my last dollars on without regret. They’re like sugar butter. 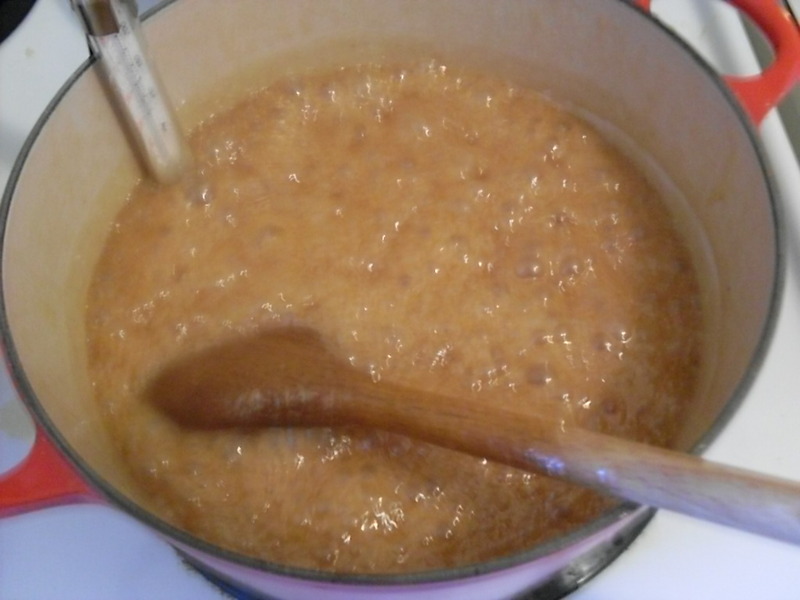 Fortunately, I am becoming slightly wiser as I age – I realized that you can make caramels at home! And we always have butter, sugar, and cream here (I don’t know why we’re putting so much weight on either), so to make a batch of caramels required no special shopping trip. 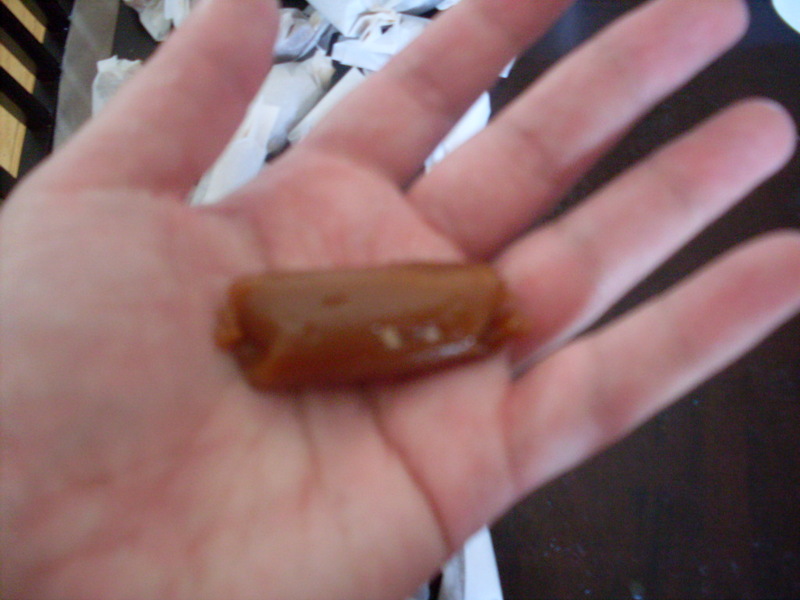 Making caramel is about the easiest thing ever. It doesn’t seem like it, because molten sugar can be a bit daunting, and a candy thermometer is not everyone’s favourite kitchen tool. But a few ingredients and a little bit of science/magic, and it’s amazing what heat can do. I don’t have fleur de del, but it doesn’t really matter. A little bit of sea salt in the caramel and some smoked salt for finishing, and these are every bit as delightful as something you could go and buy. If you don’t have smoked salt, use kosher salt, or some other coarse, delicious finishing salt. In a medium saucepan, bring cream, butter, and salt to a gentle boil. Remove from heat and stir in vanilla. Set aside. 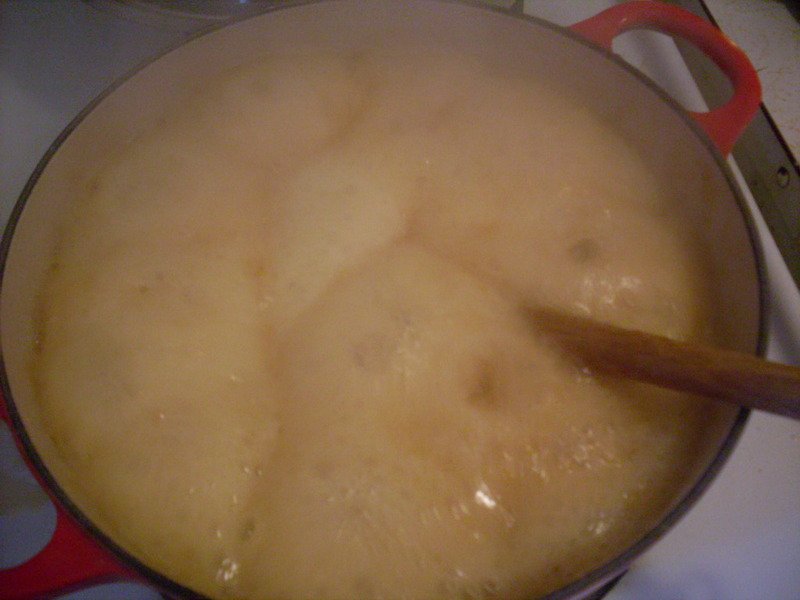 In a large (three or four quart), heavy-bottomed pot over medium-high heat, combine sugar, golden syrup, and water. You can use corn syrup if that’s what you’ve got, but there’s a little rumor going around that high-fructose corn syrup is bad for you. Of course, butter and sugar and cream are not. Allow sugar to melt before stirring. Stir occasionally with a wooden spoon, watching the sugar closely to ensure that it doesn’t burn. Nothing is a bigger culinary piss-off than getting excited about candy and then burning it. I let mine cook until it reached a red-amber hue. If you go darker than that, the caramel will take on a smokey, slightly burnt taste, which can be sort of good, but more often than not just tastes like you overcooked the sugar. When your sugar is bubbly and red-amber, pour in the cream mixture. Don’t freak out. This is going to swell and bubble and threaten to maim you, but it probably won’t. If it didn’t maim me, you’re probably safe – I don’t do anything carefully. Reduce heat to medium, and clip in your candy thermometer. Stir occasionally. 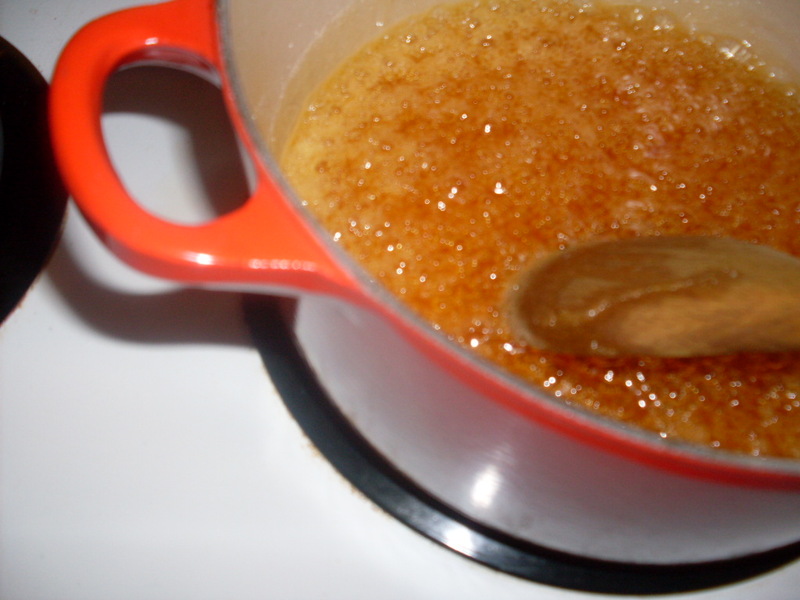 You want the caramel to reach between 245°F and 250°F, which should take between ten and 15 minutes. Don’t rush it. 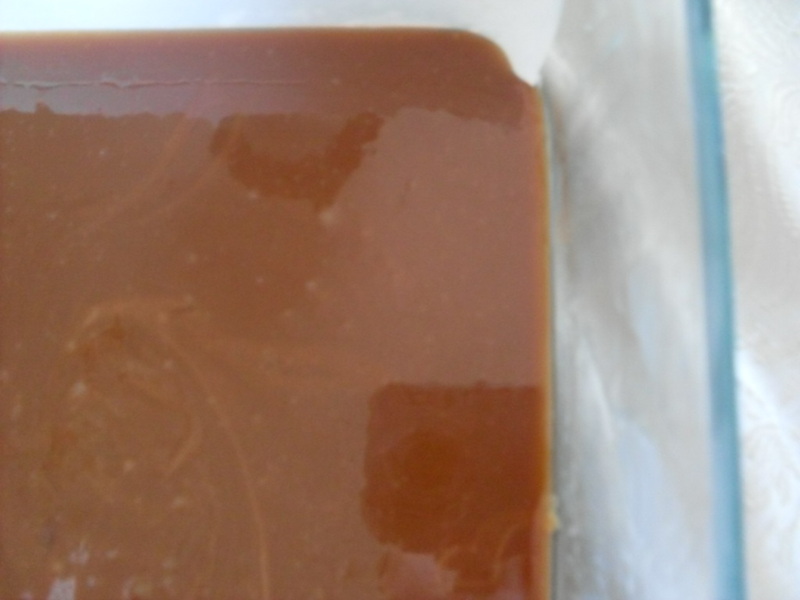 Pour caramel into a 9″x9″ baking dish that’s been buttered and lined with parchment, which you should have also lightly buttered, for good measure. Tip: when lining the bottom of the pan, cut the parchment too long, so that you end up with pieces sticking up on either side; these will act as handles when you go to take your caramel out of the pan – much easier. Let cool for 30 minutes. 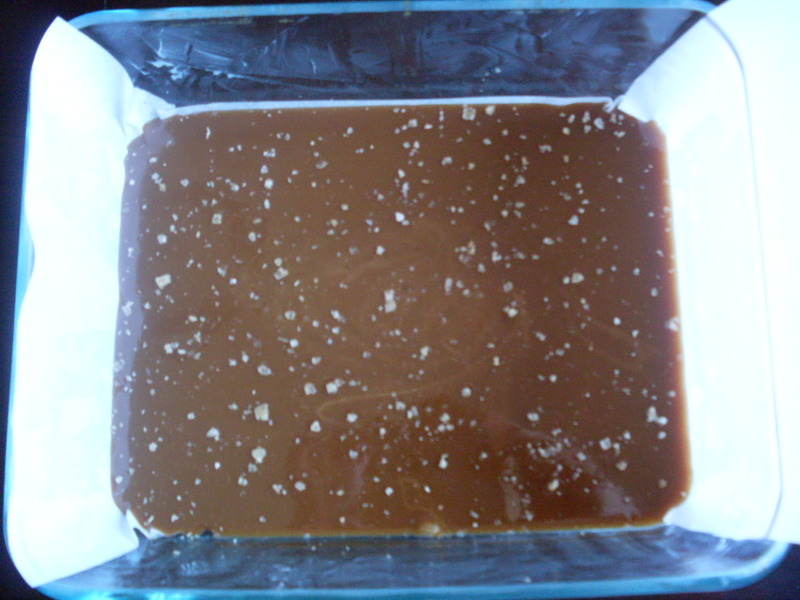 After 30 minutes, sprinkle salt over top of the caramel. Let rest for two hours. Cut into one-inch squares with a sharp knife dipped in cold water. 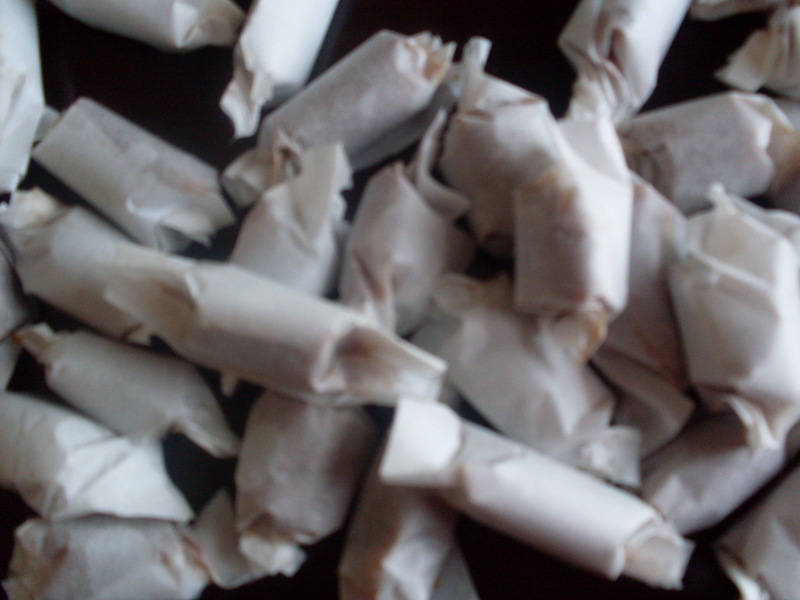 You should end up with about 50 caramels. You lucky duck. You can proceed to wrap each one with parchment or wax paper, or put each one into those little candy cups that look like mini cupcake wrappers. I’m sure they have a name, and I bet you can Google it. Serve. To others, to mom (happy Mother’s Day! ), or just to yourself. Enjoy! < Previous Some people use air fresheners, but I prefer spicy cakes. Next > Creamy, springy trout chowder. Ha! You don’t need my permission. You can use any salt you want, anytime! It is easy! I think it’s best made on a sunny day – I wonder how humidity would affect these. But packaged up prettily for the holidays, these would be a wonderful gift!